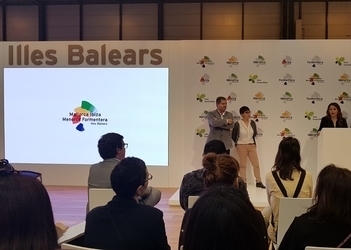 Tourism councillor Alejandra Ferrer stood before representatives of trade media outlets today midday at Madrid's International Tourism Trade Fair (FITUR) to talk about Formentera's qualities as a destination for sport. The gathering was part of the Formentera Council's promotional efforts at the country's leading travel expo, which continues until Sunday. The moment served to spotlight the island's 2019 calendar of sporting events, not to mention spread the gospel about what Ferrer called “the backdrop of nature, scenery, culture and gastronomy awaiting athletes of all sorts who opt to make their fitness pursuits the opportunity for a visit to the island”. Ferrer underscored sporting events like the half-marathon (Mitja Marató), Formentera All Round Trail, Formentera to Run, Marnaton, mountain bikers' Volta a Formentera and the island's triathlon. She said recent years have seen Formentera become a destination for fitness aficionados and highlighted “the stress event organisers place on protecting the environment and using natural resources without depleting them, one reason local gatherings always have a cap on attendance”. The Council spokeswoman also presented, together with the fitness event organisers of Unisport Consulting and transport company Trasmediterránea, a deal to improve travel options to the island for individuals coming from mainland Spain and Palma to join events like the half-marathon, the Volta and the triathlon. To that end, Trasmediterránea offers athletes discounted tickets on journeys to the islands from Palma, Barcelona, Valencia and Gandia. Athletes can also bring their gear (bicycle included) for free. The councillor hailed the deal, which she said was about “making it easier for sports lovers to get to the island and to get here with their own equipment, too”. Ferrer also drew attention to the discounts and bonuses that local businesses offer as part of the “Discover Formentera” pushes in May and October.